Although kimej as used in hand-crafts was only introduced during the Japanese period, it is very widely used in almost all bowls, trays, basins, plates, wall decorations, purses, jewelry and many other products of today. Kimej is very white and thin, much like strips of a semi-transparent paper. Any hand-craft article that is woven (excluding mats) and has a white color or has been dyed by commercial dyes (such as all blues, greens, yellows, etc.) will have been made with kimej. Kimej is made from the juubub (new shoot of a coconut frond) which appears at the center of the tree. The juubub is cut before it starts to open. The nok (midrib of a coconut leaf) is torn off and two long thin leaves appear. The inside sides of these leaves (the sides that had been facing each other before the nok was removed) are scraped with a knife. This is done by placing the leaf under the knife, then holding the knife blade at an angle to the leaf and pressing down on the knife and pulling the leaf under the edge of the knife. This scrapes off the skin of the leaf which is about one half inch wide, very thin and almost transparent. This skin is then boiled in water until it turns white. It is hung to dry and while drying the strips are straightened by running the skin between the fingers. When the kimej is dried it is split into thinner strips as desired for weaving. All colored kimej is dyed with commercial dyes. The use of mālwe in hand-crafts was brought to the Marshalls during the Japanese times from other areas in Micronesia. All woven products (baskets, trays, hot plates, wall decorations, etc.) except mats, and purses that are not rounded in shape, are made with mālwe. Mālwe is made by stripping the pāp (coconut frond midrib). The soft white inner part is scraped off and just the hard smooth skin part is left. It is very flexible when dry or moist, thus it can be easily bent to the desired shape. Mālwe gives the article its shape and makes it sturdy, and provides the hard material that the maan̄ or kimej can be wrapped around. (1) Mālwe — covered and tied together only with white (undyed) kimej. (2) Mālwe — covered and tied together with different colors of kimej which can create numerous patterns. (3) Mālwe — covered and tied together only with maan̄bil (tannish-brown color) or maan̄rar (off-white color). (4) Mālwe — covered with maan̄ but tied together with kimej (colored or white) which also creates various patterns. All trays, bowls, basins, wall decorations, hot plates, round-shaped purses, and sewing baskets are made from mālwe using the four possible combinations of kimej and maan̄. 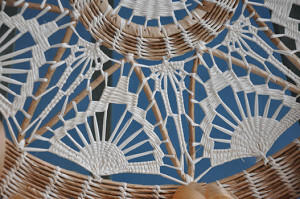 New patterns and designs are continually being created by the individual weavers. A tape, following the contour of the article, measured between the two farthest points, determines the size and price of these articles. In this way the depth of a bowl, tray, or basket is included in the total measurement.